I get tired of “typical” snacks. You buy the same food and eat the same snacks but they can get boring. Here’s a new snack that I enjoyed and it can have some variation so if you’re bored of snacks then try this. A new way to get those wonderful carrots in, right? We know that carrots have Vitamin A, K and C which help eyesight, kidney health, healthy immune function, preventing non-Hodgkin Lymphoma, strong bones, strong teeth, and healthy gums. 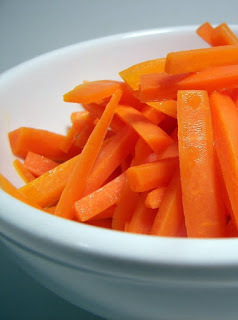 Plus it’s a good source of fiber with 1 medium carrot providing 2 grams of fiber. It is also a good source of potassium which is the third most abundant vitamin in our bodies. This helps with electrolyte balance which is important for hydration, reduces the risk of stroke, anxiety, lowers high blood pressure, helps maintain your metabolism, plus it improves the health of your muscles, heart, and nervous system. Plus, the apples and spinach are great additions. Read the post of apple benefits HERE. Read about the benefits of spinach HERE. 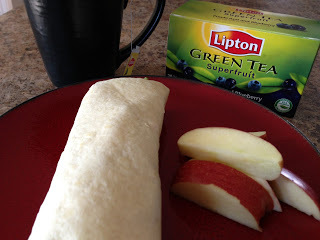 I used organic vanilla yogurt on this wrap. To be honest, not my favorite at all. Next time I will do hummus or cheese. The yogurt was too sweet for the overall wrap. Just a weird combo in my opinion. I still liked the rest of the wrap. But as I was eating it I just wanted cheese. Ha. So put a little colby jack and wowsers. I would be interested to see what peanut butter tastes like. If you try it let me know. 1. 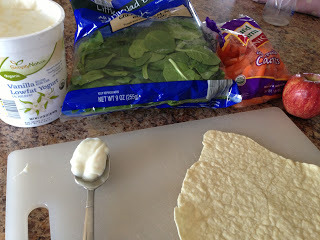 Put choice of yogurt, cheese, or hummus on tortilla. 2. 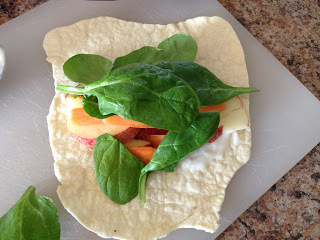 Slice apple and put half in tortilla. 3. Put baby carrots and spinach on top. 5. 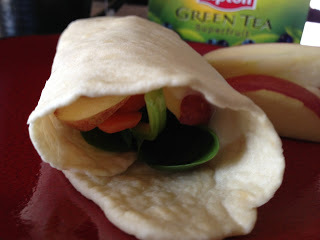 Cut the rest of apple and eat in slices with the wrap. 6. Enjoy with some green tea like I did.